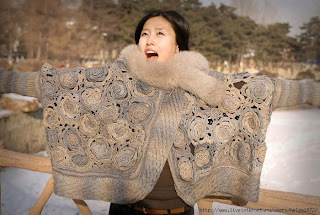 Outstanding Crochet: Chinese Roses. Pattern. Video "How to". Bad quality though. AH, it's not a good quality picture. I rather posted it as just an image. Check it out again. I added a chart. Thank you for the chart. Much easier to read!! They are different. I added the tutorial for you I found somewhere. Enjoy and good luck! Hi, some of your images from the red roses are not uploading, so I can't see the full tutorial!! Is there a chart for them? Natalia - THANK YOU, THANK YOU. This is so beautiful. Seeing your blog always inspires me to try something new. I am still a new crocheter so this is probably way past my skill level - plus I can't read chinese to understand the step by step process...ah...someday. Everything we didn't do before seems hard. You just have to try. You are going to feel so good after all. Try it! Good luck! I am glad I am inspiring you, that's my goal. I understand.We all different. Some people perceive words better that images. I learn from what I read and see, not from what I hear for example. Which one is the red roses pattern? There is a tutorial for red roses, no pattern. I want to make a baby blanket for a friend - do you have a pattern for the fifth photo on this page - the one in Lilac? Hi Korneliya, the diagram in the post, that's all. Make some flowers bigger, adding rows, put smaller flowers in between. There is no other pattern. Sorry. Hi! I am sorry to say this is all I have and I am 99% sure it's all you can find on WEB. 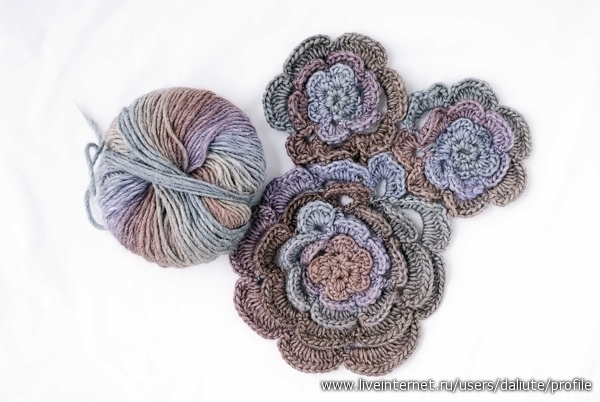 pull yarn through last stitch, leave a string to the center of next flower, repeat second flower and so on. I don't know if it's clear, try to make it and you will see how it goes. I am not sure about how many stitches one should make for every petal. I guess it would be clear in the process. You know what, I'll try it myself and post it. Sorry for taking time to answer! Thank you It just might help! The last 16 or so pictures after the last one with the chart and the model do not load (may be a compatibility issuer, I have windows 7). 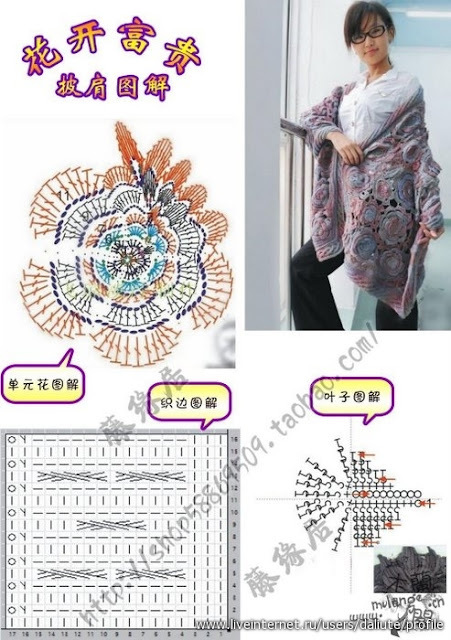 Is this on Ravelry or somewhere or have you written this up (I see it is an older post) Thanks. Sorry, there is nothing I can do.